The kind of buyers you want are Relationship Buyers. These are people who are looking for service. They look for a reliable supplier with friendly employees with whom they can establish a long-term relationship. They will expect you to do favors for them, of course: to special order items when they need them; to make Saturday deliveries when they are behind on a job. But, in return, you will get all of their business. They know that they could save a buck by shopping around, but they don’t want to do that. They like the comfort of knowing that in you, they have a friendly helpful supplier who knows their name, knows their preferences, and recognizes them. It is possible to reinforce customer loyalty and increase your sales volume by building a customer database and using it to build a relationship with your good customers. You will learn from a database who your top customers are and how much they spend with you. You will learn who your second tier customers are — those who, with a little stroking, can join the ranks of your prime supporters. You will also learn the identity of the losers — customers who cost you more in service than they bring in profits. Database marketing works — but only with relationship buyers. It will not work with every day low price suppliers. If you are one of these, don’t try it. You will lose the money invested in your database. That is why Staples dropped their membership card. It wasn’t working with their type of customers. If you do have a database, your next step is to use it to build your customer relationships, increase loyalty and purchase volume. How can you do this? The first step is recognition. Find out who your best customers are at each of your retail stores. Provide your store managers with the names and profiles of these customers. Teach them to recognize them and greet them by name when they come in to buy. 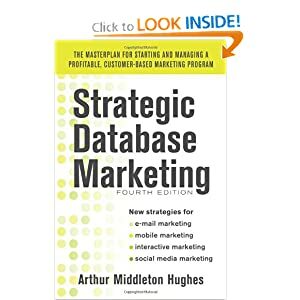 There is one primary rule for database marketing. It only works if the customer benefits from it. If the customer says to herself, “I’m glad that we’re on that database because…” You have to fill in the rest: gold cards, points, surveys, personal letters, special parking, special deliveries, reports on purchases by department, newsletters, training programs, business seminars etc. Once your have built a customer database and have used it to find out about your customers and to recognize them, there is an important step that you can take to produce real profits from the database. That is to code your database for RFM. RFM stands for Recency, Frequency, Monetary Analysis. It is a tremendously profitable way of classifying customers that does not require a modeler or statistician. It is something that you can do using your database on your PC. Let me illustrate how it is done. To code for Recency, you must keep in everyone’s database record the most recent date that they have made a purchase. Once the most recent date is present in the record, you sort your entire database by that date going from most recent to most ancient. You then divide your entire database into five equal “quintiles”. All the records in the top quintile you code as a “5”. Those in the next older quintile are coded as “4”, etc. Everyone has now a single new recency code in their database record: a 5, 4, 3, 2 or 1. You will note that the first quintile (the most recent) had average response rates (3.49%) that were almost three times the next quintile (1.25%). This is typical. Recency is just about the most powerful behavioral factor that you can bring to bear on a marketing analysis. But Recency is only the beginning. You must also include codes for Frequency and Monetary. Finally, you put a monetary code in every database record based on total dollars spent with you, coding them as 5, 4, 3, 2, or 1. You will get similar results. As a result of the RFM coding, every customer in your database has a three-digit code in their record. Everyone is either a 555, 554, 553, 552, 551, 545, 544, etc. down to a 111. There are 125 RFM cells in all. We are now ready to use these cells to make serious money with our database. On this chart we have compared the response of each group of customers in each cell. The ones above the line did better than break even: the profit from sales to this group did better than the cost of the promotion. Those below the line lost money. In this chart, which is an actual result of a promotion in 1995, only 34 cells broken even or better. The remaining 91 cells lost money. Once you know how each group of customers (by RFM Cell) reacts to your offers, you can use this to guide your future promotions. On your rollout promotion only mail to the cells that did better than break even on your test. You will be amazed at the response you get — and your ability to drive traffic into your stores with very little effort.